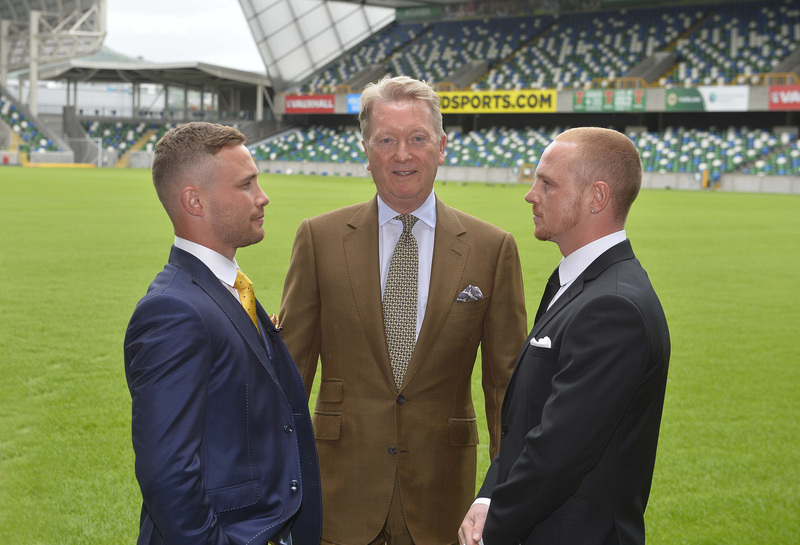 FRANK WARREN IS delighted to announce that Showtime Sports will present Carl Frampton’s interim featherweight title defense and the second comeback fight of lineal heavyweight champion Tyson Fury on Saturday, August 18 live from Belfast, Northern Ireland. Former two-division champion Frampton will defend his interim WBO Featherweight Title against undefeated Australian contender Luke Jackson on the pitch at Windsor Park, where an expected 30,000 fans will witness the first boxing event at the home of Northern Irish football. In the opening bout, former IBF, WBA and WBO Heavyweight World Champion Fury will square off against two-time heavyweight title challenger Francesco Pianeta in Fury’s second comeback fight after a two-and-a-half year layoff. The 31-year-old Frampton (25-1, 14 KOs), who rolled back the years with an inspired performance to win the interim WBO belt against Nonito Donaire in April, will face the unbeaten Jackson as he looks to earn a second world title in one of boxing’s deepest divisions. With a victory, Frampton will target blockbuster showdowns with WBA World Champion Leo Santa Cruz, WBC World Champion Gary Russell Jr., and IBF World Champion Josh Warrington, all of whom have appeared on SHOWTIME platforms in 2018. The WBO’s interim champion is also in line to fight full titlist Oscar Valdez, who is recovering from surgery to repair a fractured jaw. Jackson (16-0, 7 KOs) was the captain of the Australian boxing team at the 2012 London Olympics and has won 16 consecutive fights since turning pro in 2013. The 33-year-old is confident he can upset Frampton in front of his hometown fans and earn a title shot in the deep 126-pound division. Fury (26-0, 19 KOs) returned to the ring in June with a victory over Sefer Seferi, an outmatched opponent who retired on his stool after four rounds. Southpaw Francesco Pianeta (35-4-1, 21 KOs) represents a significant step-up in opposition for the 29-year-old Manchester native. Prior to his nearly three-year layoff, the 6-foot-9 Fury established himself as the premier heavyweight boxer in the world by becoming the first man to defeat Wladimir Klitschko in more than 11 years—and by taking the IBF, WBA and WBO world title belts from the Ukrainian great in the process. Pianeta (35-4-1, 21 KOs), a 6-foot-5 southpaw who fights out of Germany, has twice challenged for the heavyweight world title. Pianeta faced then-unified champion WladimirKlitschko in 2013 and lost in a bid for a secondary title against Ruslan Chagaev in 2015. A win over Fury would could put the 33-year-old Italian native back in the heavyweight title picture.